I’m not sure if there’s a rank-order of the importance of these ingredients to a successful math classroom, but let’s just say that they have equal weight: a third, a third, a third. As I look at my own posts, others’ posts that I’ve bookmarked and favorited, and where I spend most of my time, it looks roughly like this. I’d give it a 60%-30%-10% split, and that 10% might even be generous. 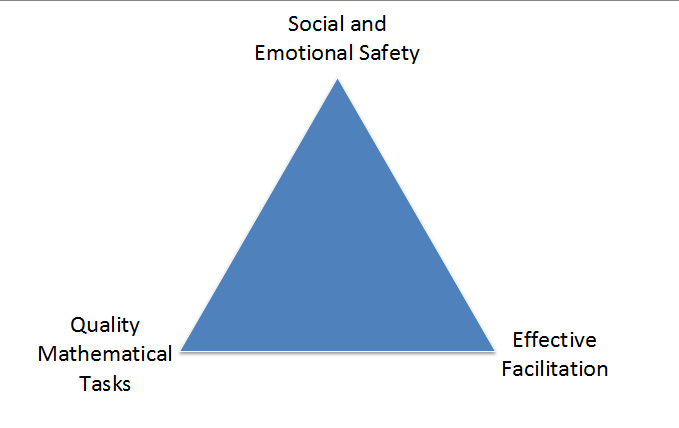 In other words, social and emotional safety is something I rarely think about, and even more rarely blog about. In Jo Boaler’s “How To Learn Math” course, she shares interviews with former math students who exhibit signs of trauma. That’s the word she and they use: trauma. While I think most math teachers that I read and follow probably understand the need for developing a safe place emotionally and socially for the classroom, it’s something I don’t come across that often. Much of that is my own fault. 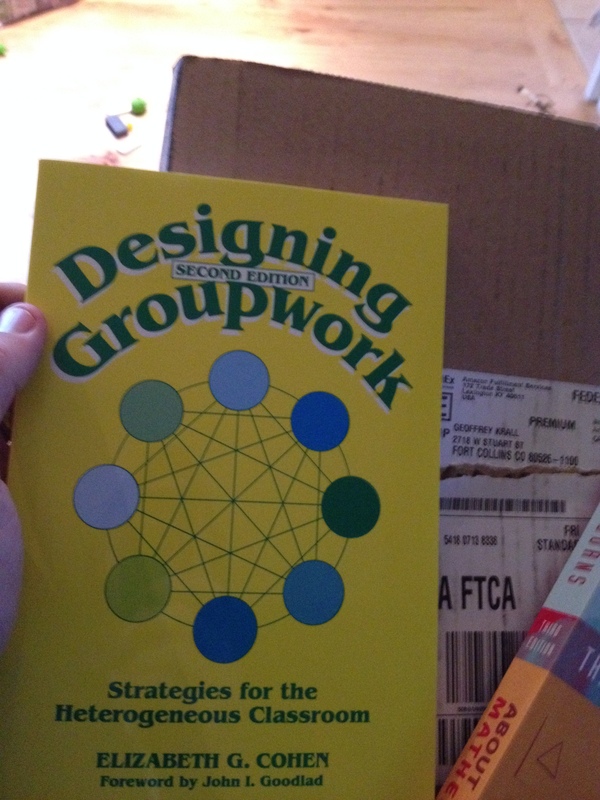 I spend most of my time blogging and talking about cool, engaging tasks and nifty facilitation moves. I don’t spend much time at all trying to flatten the spoken and unspoken social structures that crop up in nearly all classrooms. Part of this is that it’s actually much harder work to do that than designing a cool task based around an article or something. It’s also something that really can’t be modeled in a few-hour single PD session. It’s also probably in part because I’m a dude. This post on the prevalence of males and math tasks has been lodged in my brain like a tumor. I can forget about it for a few days at a time, but every now and then it’ll pop up and I’m reduced to a stammering mess. I hope I’m not gender-norming when I suggest males tend to be more in to designing tasks and “troubleshooting” student engagement and less adherent to the social and emotional component accompanied with mathematics classrooms, which is just as if not more important than the other ingredients. I certainly have spent 10-to-1 time or more on designing, finding, and thinking about mathematical tasks versus flattening the social status of mathematics learners. Again, the ratio of what makes for a successful math learning experience is off, either in what I’m reading or what’s actually out there. Probably both. Consider this post part confession, part imploration. My lack of writing on the social and emotional structures is something that has shaken and convicted me. It’s also something that damn hard to find posts on throughout the Math ed blogosphere. Maybe I’m looking in the wrong places, but I am looking and not finding much. Consider this not only an imploration for math bloggers to blog about developing social safety in math classes, but also to share these more often (starting in the comments here, pretty please?). I can’t promise that I’ll start blogging about how to develop a flatter math classroom as I can’t be sure I’ll acquire any unique insight other than copying and pasting what others have said. But I do plan on making this a huge point of learning for myself this year. I want to read more about developing an emotionally and socially safe math classroom that flattens structures and gives students an in to mathematics. I want to write more about it too. Update 2/5/2014: Glad I’m not the only one struggling with this. 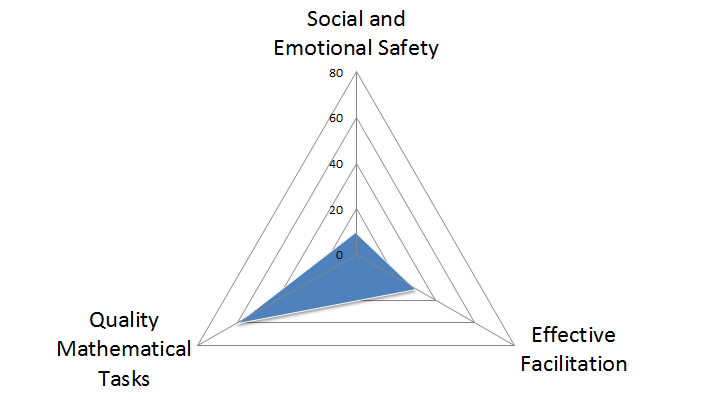 Erica Synder finds a nice analog of the social and emotional safety structures with Digital Learning. Previous Entry:Just how silly is a 45-day weather forecast? And while we’re at it, just how good is a 2-day forecast? But I do remember being very attentive to emotion in the classroom. Maybe the absence of an emotional connection to the students has made it easier to develop tasks. (I do have an emotional connection with the teachers.) Nah, it’s that I have more time because I’m not grading anything! Anyway, one technique that I always used to make my classroom feel safe was the way I chose students to share homework solutions. We made a “hit list” on the board of problems that needed to be reviewed. I kept a tally sheet, with students listed alphabetically. I would go in order, asking the next student on the sheet to pick a HW problem from the hit list. Here’s the safe part: they could pass. But, the next time they got picked first, and that was usually ok because then they had a wider choice of problems. After one pass, if they couldn’t do any on the next day’s hit list, they could choose a partner to help at the board. That was a good way for me to make sure everyone had a chance, but no one felt “on the spot.” I also never called on anyone who didn’t volunteer. Often I would have everyone write a guess and share it privately as I went around the room. Stress = cortisone release = decreased reasoning capacity. Or something like that. I wish you well in your quest to balance your triangle! I have seen it, and I love it! Thanks for the reminder though, I’ll share it with my teachers. I agree, and our student survey data supports you. Math is the only subject in which large numbers of kids feel ‘stupid’ and where that is cited as a major reason for liking math the least of any subject. (Other subjects are disliked more because of the work assigned). In their own words, they follow up by saying things like: I hate math because there is no room for creativity, I am always worried baout mistakes, I feel dumb. My point: it’s not the manner of the teacher that’s at stake in social/emotional safe space. It’s often the typical way in which thinking and risk-taking is handled by the work assigned and the feedback given. It is habitual practice for teachers to call on students whom they are confident will have the right answer or are brave enough to not worry if they have the wrong answer, while the intellectually struggling and (often coinciding) emotionally fragile are generally left alone (or are allowed “to pass”). Many teachers won’t admit to this silent favouritism, but studies of classroom interactions bear this out. The first is that teachers are not fully prepared ahead of time to have a comeback for every possible wrong answer, and so wrong answers cause awkward moments. This can happen when a teacher slaps together a lesson the night before, but even reusing a lesson years old often doesn’t make a difference. See the blog mathmistakes.org for an ongoing discussion amongst teachers who are taking a reactive, not proactive approach to wrong answers. Believe it or not, there are teachers that have worked out in advance every possible wrong path that students might go down, and have prepared, also in advance, responses for all of them. It may not seem so, but mistakes are of a finite, not infinite, variety. The second reason for avoidance goes toward what you are saying: most teachers’ unwillingness (or inability, whatever the root cause) to work through to a corrected solution in front of the entire class with a student who provided a wrong answer, even though a significant portion of the class may be having the same difficulty. You may not be finding posts in the blogosphere because these scenarios we describe are the most common in Western, English speaking countries. Go to top-performing nations’ classrooms and you will find exactly the opposite: the student who has made the least progress in solving a problem is asked to go to the board (we say “asked”, but it’s not optional) and the teacher will work through the entire problem with that student while the others watch respectfully without poking fun. Thus the weakest student is raised up, whilst not fearing for his/her emotional safety. We know that last part, “while the others watch respectfully”, is the rub; building that kind of atmosphere in a classroom where it hasn’t previously existed is no small hurdle. I agree – really tough to be the first math teacher a kid has had that values them and their mathematical brain. I mean, you have one year to undo perhaps a decade of self-identity. To your first paragraph, I fully admit that I tended to call on students who I was pretty sure was going to get it right. It wasn’t until I started being intentional about documenting who I call on that my practice started to change. Sue, I probably should have started a list of math teacher blogs that do sometimes clear the path for social and emotional safety. Cheesemonkey is definitely one. I’d also add yours, Ilana Horn’s and a few others. Do you have any posts to point to that specifically addresses why/how to develop students’ self-worth in math? I tend to find a lot of posts on what an emotional struggle it is to teach, but still very few on the student’s emotional struggle of learning math. I don’t think I’ve addressed it specifically, though I’d guess this issue is an undercurrent in many of my posts. Can you link to Ilana Horn’s blog? Is the the tumblr one I’ve just found? Yeah, just the tumblr she has linked on her twitter page. My primary focus has been on developing intriguing tasks as well, and I am starting to notice more that my students have less resilience and perseverance when they encounter a tough problem. A safe environment has been something that I have tried to maintain through how I interact with the students, but it has become clear that they have a lot if baggage they bring with them either from pressure to do well at home or from previous encounters with math that didn’t go well. Those factors have had a much larger impact on my struggling students. Whether they are new to struggling or too familiar with the experience, it is difficult for them to get used to experimenting and exploring when they are so adverse to perceived failure. I could definitely stand to focus more of my attention on making my classes a safer place for productive failures. Reading this post, I think about how classroom management is often the elephant in the room when talking about why a teacher is not finding the success he or she is looking for. Think about having a conversation with a colleague who is trying to improve his or her instructional practices. If the issue is a lack of “quality mathematical tasks” then you would not feel uncomfortable sharing a task that might help this teacher. However, it would be more challenging to help a teacher if the way he or she runs the class leads to it being ineffectively facilitated or an unsafe environment. I certainly agree that you must have a safe classroom environment. Without it, many students shut down and you don’t have the productivity you need. Hi Geoff — Max Ray writes extensively about structures attending to the dynamics that make a class socially and emotionally safe in this book. It would make a great addition to your reading list. Thanks for the heads up, Kate. I’ll be buying this for myself for Christmas.